Decameron Beach Resort Review: Decameron Beach Resort is located in Juan Dolio, 25 minutes from Las Americas International Airport. The resort is set directly on a beautiful white sand beach, nestled in the lush gardens in tropical paradise. 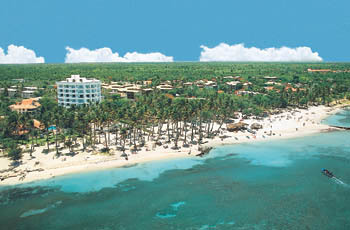 Decameron Beach Resort is a short drive from Santo Domingo, the capital of the Dominican Republic. Santo Domingo is a fascinating city to explore, as it still has many of its original buildings. The Colonial character of this historical city as seen through its architecture is a definite drawing card to the area. Decameron Beach Resort offers delicious food in four different restaurants, exhilarating activities and a friendly, welcoming atmosphere. Pack your clubs and try out the Golf in the area. The Dominican has become a golf hot spot in the last few years, with its professionally designed courses and consistently beautiful weather. Explore the beautiful colors of the tropical fish under the sea, the adrenaline rush of sailing on the open water, and comfort of the Decameron Resort rooms. 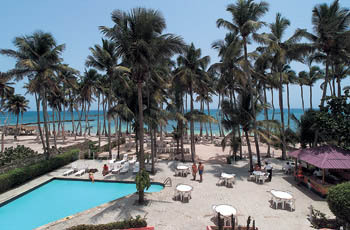 Decameron Beach Resort Review Rooms: The resort has 440 rooms in 16 different buildings. All of the rooms are air-conditioned. Standard rooms also include a Queen size bed or two double beds and a private balcony or terrace. Rooms have quick access to the beach. 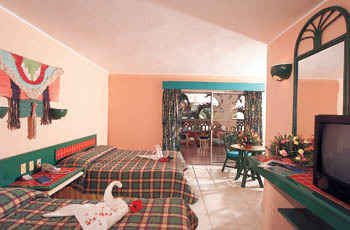 The resort rooms are kept clean and equipped for your convenience. 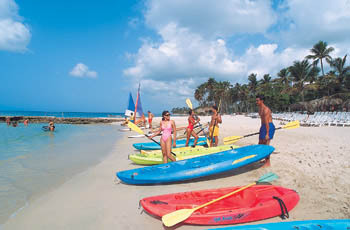 Decameron Beach Resort Review Activities: The activities offered at Decameron Beach Resort will get your heart pumping. Play a little tennis at one of three different tennis courts. Water sports are always a hit, and the resort offers plenty to choose from. Book an excursion with the tour desk or sit back and soak up the sun by the pool or on the beach. Let your kids be part of the Kids’ club, offered by the resort and take advantage of a little quiet time to yourselves. Keep in shape at the fitness club and be entertained by the staff during the day or by the high energy, nightly shows. Decameron Beach Resort Review Restaurants and Bars: The resort offers four different restaurants, that serve a variety of delicious food. The buffet serves breakfast, lunch and supper. There are three a la carte restaurants, serving Italian, Brazilian and Mexican specialties. Bars at the resort serve unlimited domestic alcoholic and non-alcoholic drinks. Room service is available at an extra cost. Decameron Beach Resort offers everything you are looking for in the perfect vacation for your family, a romantic getaway, a soothing retreat or maybe you are simply looking for paradise. Anxious for your trip to Decameron Santo Domingo? Hit any of the "Get Quote" buttons on the page and we'll send you a booking confirmation form or give us a call toll-free and we'll answer any questions you may have. Let's make that dream vacation a reality - join the Punta Cana Information Guide Family. Do your own Decameron Beach Resort Review this season!